I am often surprised at how people are concerned when using food to reward a dog for desirable behaviour. Some people feel it's a form of 'bribery'. We all do things for a reward. Would you go to work for free? Not all dogs are food motivated of course, so we may need to find another motivator such as a toy or a simple praise-worthy voice and a chest rub. So many people struggle needlessly with trying to get a dog to walk to heel, or to recall when asked, and avoid food for whatever reason. If it works, use it! It doesn't need to be rubbish food either. Many a dog would be motivated for a slice of carrot, or a slither of dried fruit (avoid grapes). Up the ante maybe and look to use small chicken cubes, ham, or make some liver cake! Keep them as small as you can. Some treats are very well suited for pinching and holding by you between your thumb and forefinger. This can make a treat last anything up to 30 seconds as the dog works it out of your fingers as you squeeze and release it gradually. This may not be possible for a greedy dog! I have a few clients at present going the whole hog with the use of food, and they are actually offering the dog's meal (dried kibble is most common, but a switch to a moist food such as Nature Diet will often turn a picky eater on) when out for the recall or even reforming a habitual and serious lead puller! 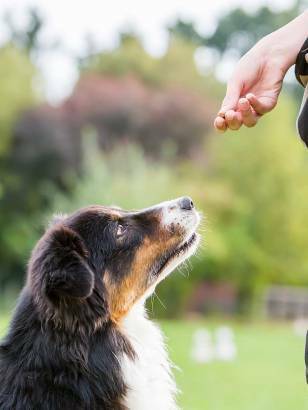 Satisfying the basic drive of hunger can transform how a dog sees you if you are having leadership issues in general, failing to return when called, or staying close with heelwork can be made so much easier when the dog is getting some very serious rewarding. So, use food by all means, but as the behaviour is looking sound then seek to reduce it by alternate rewards, then reward the very best position or fastest of recalls, then drop the food with an occasional reward to keep the interest there. I will use food throughout the whole life of a dog on a periodic basis to ensure adequate interest and reward....can't go making a dog redundant can we?